The end of a conversation about people parading into Pitti. About its silliness. About therefore, naturally, the Ministry of Silly Walks. 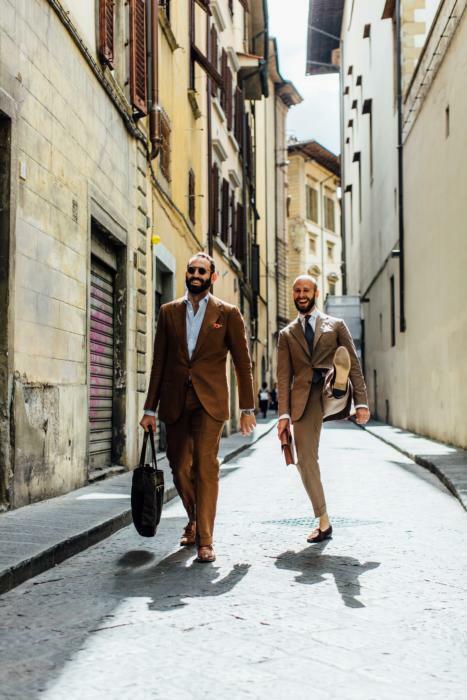 Fuller Pitti coverage next week - our Young Tailors Symposium on Wednesday, which was wonderful, and some great brands and tailors in Florence and Milan. Above, wearing an Elia Caliendo suit in Holland & Sherry cotton, with my dark-brown suede Sagans. Carrying my old Alfred Dunhill box. Greg Lellouche in the cloth of the summer - tobacco linen. No silly man walks alone. You can follow the discussion on The Pitti of silly walks by entering your email address in the box below. You will then receive an email every time a new comment is added. These will also contain a link to a page where you can stop the alerts, and remove all of your related data from the site. Ha! Auditioning for faulty towers?? The gent with the tote bag. Have you got details of his suit. It looks great. Isn’t it too hot wearing those clothes in the summer? Don’t you sweat? I was wondering if there are any specific leather wash bags that you could recommend? Great picture and two terrific suits. I can’t buy into the ‘no socks’ look on this occasion though. It seems to go against the rule of showing flesh between trouser and shoe when dressing this formally. Looking forward to the Pitti coverage! One a separate note, have you heard of London Lounge’s Cloth Club and, if so, what do you think about it? what is the fabric of the suit you are wearing. It looks absolutely stunning ! Hello Simon! This is going to be a little off topic, but I’d love your advice on something. I’m going to commission a navy blazer from my tailor, and am a little stuck on the specifics. Should I go for single breasted or double breasted? I’m a university student, and am looking to basically use this for business casual to slightly dressier occasions. The logic is that since I’m an engineering student I’m never really required to wear a suit, and one never wants to out dress one’s superiors! Also, most people will be wearing a shirt and slacks (maybe with) casual jackets, with suits lying at the very top of the formality hierarchy. Thank you in advance! !